Roasted Red Peppers have been on my radar for some time now. I have been craving them. The smooth texture, and the deep flavors from roasting the peppers. Mmmmm! Combine that with a few select pasta's that I have lined up and I have some fantastic meals planned. In case you have not roasted red peppers before I thought I would show you the perfect way to roast them and pack them. I have mine packed in the pepper juice with olive oil and garlic. Just marinating in the refrigerator until I use them in my next Roasted Red Pepper masterpiece. This will be Em's first time having a roasted red pepper dish, so I am excited about that too. Preheat oven to broil. Wash peppers and place on a baking sheet. Place baking sheet on top rack and let broil until charred. Turn the peppers, 1/4 turn. Repeat until all sides are charred. The first side with take the longest, and be careful not to leave your oven unattended. Once peppers are done. Place in a large bowl and cover tightly with aluminum foil. Allow to cool about 1 hour. The steam from the hot peppers is separating the skin from the pepper, making it easier to peel them. Meanwhile assemble the tools you will need for peeling the peppers. A cutting board, a bowl, a sieve that can sit on top of the bowl, and a paring knife. Once cool, cut the pepper on one side from top to bottom. Carefully hold pepper over sieve and allow pepper juice to drain into bowl. Remove the seeds, core and stem carefully. If you do this little by little around the core, you can remove all the seeds at once. Toss the seeds and core into the sieve, so your bowl can collect the delicious juices. You should now be able to separate the skin from the flesh with little to no effort. If the skin sticks, place the pepper skin side up on your cutting board and scrape with the back of your knife. Place charred skin into sieve. Slice pepper and place into bowl, under sieve so the pepper may absorb the juice. Repeat until all 8 peppers are in the bowl. Discard the remains in the sieve. Place 2 cloves of garlic in each pint size jar (or you can use another 2 cup container). Evenly distribute the peppers between your jars. Once filled, pour in remaining pepper juice from your bowl. Fill with olive oil to within 1/2 inch of the rim. Add one garlic clove on top. Store in your refrigerator for up to 2 weeks. I am crazy about roasted red peppers. It gives any dish an amazing flavor! Delicious, Donna! I'll definitely have to try these and I'm really interested how you use them in your recipes. Please share! Roasting peppers is such fun! I love how the smell while roasting, too. Delicious! Nice job! Definitely going to make these! I spend way too much on pre-jarred ones. I adore these - you've inspired me to make some! I love roasting peppers--gives them such a unique flavor. I can't wait to see the pastas you have lined up! Your peppers turned out great. Maybe it's time for me to give roasting peppers another chance. It's been ages since I made them. I have never roasted peppers but love roasted tomatoes! These look fantastic and I know my husband would love them. Thanks! Great post! 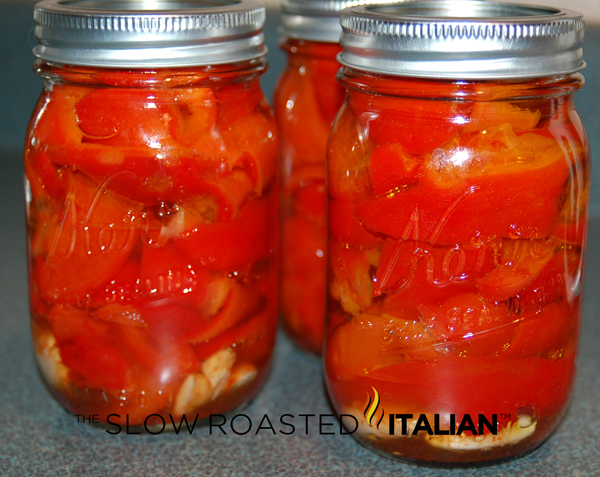 I am really loving roasted peppers lately... this is a great idea. They look fantastic and I have tonsof peppers. Can you freeze them? OMG !!!!!! So easy!!!!!!! Thank you soooooooooooooooo much!!!!!!! Thank you so much!!! This is sooooooo easy!!! !